Love the neighborhood but wish you had 3 bdrms up and majestic Sound, Elliott Bay, mtn and rolling QA views? Beautifully updated, freshly painted, hdwds, circ flr plan w/fab Western light pouring in from flr to ceiling doors/windows. Liv rm has box beam ceilings, fp w/blt ins, opens to entertainment sized deck. Fml d/rm, spacious gourmet kitch w/granite counters etc! To-die-for mstr suite/lux bath. 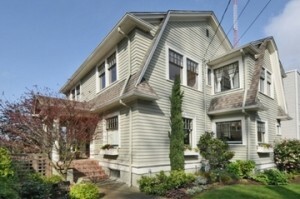 Bright fin lwr lvl rec rm/den/office w/fp, lead to sweet gardens. Detach gar + pad. Absolute gem!